There is such facility in the Android phone. For this you have to do that a new but empty file in the WhatsApp folder will be named .nomedia. By using this application you can hide any folder which have audio, videos or any file that contains images. There are few applications to be used for create .nomedia file without any efforts. 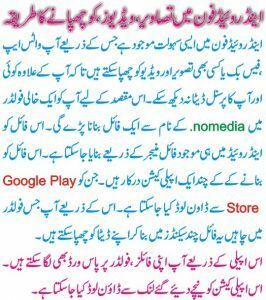 This is the most popular Nomedia application that can be downloaded from the Play Store. You can also use AppLock applications to lock or lock the gallery completely. It can not only lock the gallery but also SMS and other apps. See this link to download the Nomedia application. There are few other apps for Smartphone’s which allows you to hide your photos and videos in a personal place. These hidden photos or videos will not be available in the gallery. Check this list of best apps to hide photos and videos on any Smarphone or Android. Keep safe photo vault is a nice app available for free of cost. This app allows you to create a personal vault and save your photos in it. This app also offers a premium version with more features including family sharing. You can download this app from link given below. Private Photo Vault is similar kind of app to hide your photos and videos. You can protect your photos by adding a pin lock or pattern lock. You can download this app from link given below. Best Secret folder allows you to hide photos and videos. It lets you lock down private information with amazing security features. You can download this app from link given below. Pic Lock 4 is not just the app to hide photos and videos. This app comes with more features like hide notes, contacts, messages, locations, and audio files. It allows you to set the password, alphanumeric password, and pattern lock. This app has also have a very unique option If there are 5 wrong attempts, you can set the app to automatically erase all data from your mobile by default, this option is off you can set On if you want to do this. You can download this app from link given below. Secret photos KYMS is also a good free app to hide photos and videos in your mobile phones. You can also protect your import documents. You can download this app from link given below. Share your favorite app with us in comments. If you try any of these apps, do share your experiences with us. It can be very helpful for our visitors.